Humour is a powerful emotion and it is this that often strikes you first about Paul Robinson's paintings, and then it is texture and colour. There appears to be no subject that fails to light the spark of inspiration that sets his paint brush racing. But there is another vital ingredient, one that he shares with that other observer of people, Helen Bradley, and of course Lowry, and that is narrative - each picture tells a story, a cameo of the life of ordinary people going about their daily lives, windblown, snowbound or drenched by a downpour with handbags flapping. In a way there is a timelessness about them, though having said this there are undeniably echoes here of the 1950s. Paul was born in Penrith, Cumbria in 1959 and studied Fine Art at Carlisle College of Art. After moving to London he became a successful illustrator working for many well-known publications. 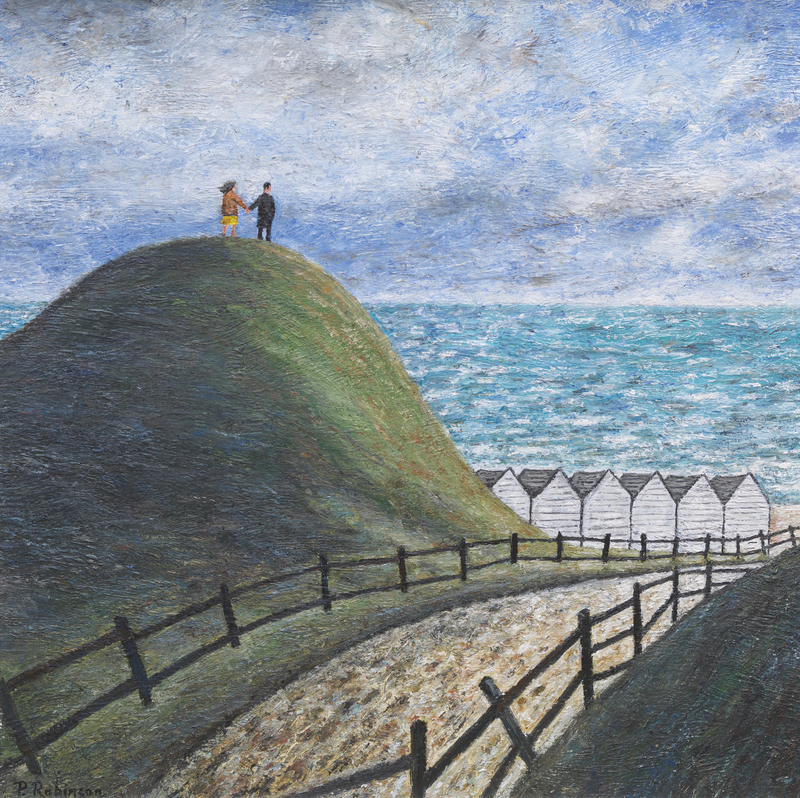 The artist's move from London to Norfolk in 1999 saw a dramatic change in his work as he discovered a whole new world of country towns, green hillsides, stormy seas and lots of space, a complete contrast to the cityscapes of London. His style is instantly recognisable and his paintings are becoming more and more collectable. Click the following link https://youtu.be/orwPidiTgsE to see a short film made by the artist's son, Will Robinson, documenting the making of Paul's most recent exhibition 'A Simple Life'. Some people have time and some people don't, wouldn't it be nice to share it all about? Man parks boat upon the shore. It's slightly askew, he's never done it before. Everything's looking lovely as she sits above the lake and yet, truth be told, the thoughts she has are mostly about cake. Early one morning, Alice and Dot didn't notice at sea the lovely red yacht. As they ambled and pondered they wished for a thrill unaware that they just walked past Hilary and Bill. Harry loves the seaside, but what he loves the best, is taking an early morning dip whilst he's fully dressed. It's Springtime in the town, the days no longer chilly. Freddy wants to go to the beach but his mother says, "don't be silly! ".